URBANPHOTO: Cities / People / Place » Regrowth or Replacement? Sweating in the bright Mediterranean sun, Glenn Eugen Ellingsen surveyed a little bit of Hong Kong in Venice. “It’s meant to be very organic,” he said, pointing to an array of wood planters, metal racks, video screens and exposed electrical wires. Ellingsen is one of the founders of HK Farm, an urban agriculture project on the roof of a factory building in Kwun Tong, and he had spent the week sourcing herbs and soil in order to recreate his farm in Venice. He turned his gaze over to a half-dozen wood planters brimming with rosemary, basil and sage. “They’re similar to what we have on the roof in Hong Kong, just a bit narrower,” he said. It was the opening day of the Hong Kong pavilion at the Venice Biennale of Architecture, the world’s most prestigious showcase of architecture and urban design, which runs until Novermber 25. 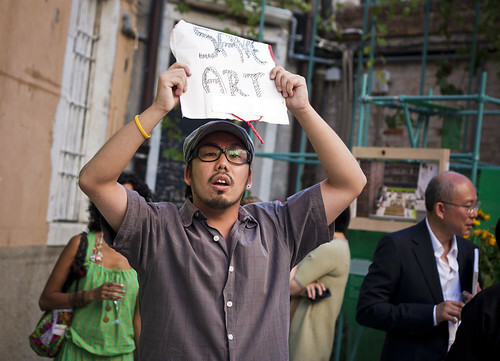 In true Hong Kong style, workers were scrambling to finish the exhibition on time, arranging architectural models and painting display cases green — the same colour as Hong Kong’s street market stalls. The choice of colour was no accident. This year’s biennale is dedicated to “Common Ground,” a theme meant to shift focus away from big-name architects to more grassroots initiatives. Hong Kong’s exhibition, “Inter Cities/Intra Cities: Ghostwriting the Future,” focuses on the future of Kowloon East, a vast swath of city that is home to 600,000 people, Hong Kong’s last remaining factories, a burgeoning office hub and the city’s biggest creative cluster, with hundreds of musicians, designers and artists. It also includes the former Kai Tak Airport, which is now being redeveloped with housing, offices and a huge cruise ship terminal and exhibition centre designed by Sir Norman Foster. The airport’s redevelopment will be used as a catalyst to transform Kowloon East into the so-called “CBD2” — a new office district that will provide an alternative to the high-priced business hubs of Hong Kong Island. Three decades ago, the industrial neighbourhoods of Kowloon Bay, Ngau Tau Kok and Kwun Tong were famous for producing toys, plastic flowers and countless other goods; Kwun Tong alone accounted for 20 percent of Hong Kong’s industrial output. When industry fled inland to the Pearl River Delta in the 1990s and 2000s, though, many factories lay vacant — until their low rents and ample square footage attracted a diverse range of small businesses, artists, designers and musicians. Given the government’s track record of redevelopment, though, many doubt that such a prescription could be filled. “You don’t have diversity when the government is involved,” said architect Rocco Yim, who designed the government’s new headquarters at Tamar. “In Kwun Tong, the recent development has been top-down,” says Tris Kee, head of the University of Hong Kong’s Community Project Workshop, whose video interviews of 12 Kwun Tong residents are on display at the biennale. She points to the redevelopment of Yue Man Square in Kwun Tong, whose bustling alleyways, shopping streets and low-rise tenements are being replaced with a glitzy cluster of skyscrapers and shopping malls. “They’ve put down a big master plan and taken out the heart of the district,” she says. “Yes, you’re upgrading the quality of buildings, but it creates a lot of problems as well.” Many small businesses owners displaced by the redevelopment say they won’t be able to afford the rent when the project is complete. Ling points out that 46 percent of Hong Kong’s new office development is already taking place in Kwun Tong, Ngau Tau Kok and Kowloon Bay, so his job is manage the change that is already underway. 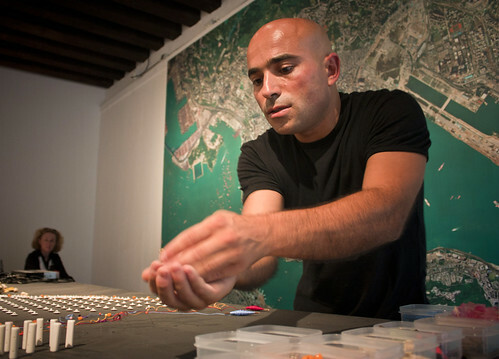 Rather than a strict master plan, Ling has developed a series of guidelines that call for better pedestrian linkages, improved access to the waterfront and space for art and culture. 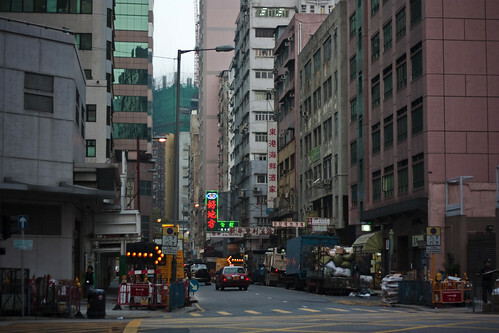 He also notes that 90 percent of Kwun Tong businesses have fewer than 10 employees, so finding a way to keep the area affordable for small companies will be crucial to its success. “We need to retain the incubator function, because small and medium businesses are the real energy of Hong Kong,” he says. Christopher Law says it will be vital to keep the government from micromanaging the area. “What is needed is not help from the government,” he says. “We need to develop new types of NGOs that are not depending on government funding” that can provide affordable spaces to small businesses, cultural venues and creative industries. From the outside, there is little to distinguish the Easy-Pack Industrial Building from its neighbours on Wai Yip Street, the industrial spine of Kowloon East. 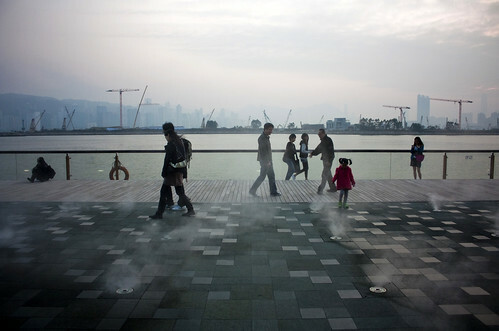 But it may well offer a vision for how Kowloon East’s diversity can be preserved. Spread across its six floors is an informal community of creative businesses: designers, furniture makers and, on the top floor, 2 Years Ahead, a studio that runs HK Farm and a host of other projects. The week after the biennale’s opening, HK Farm co-founder Michael Leung stood next to an okra plant on the Easy-Pack roof. 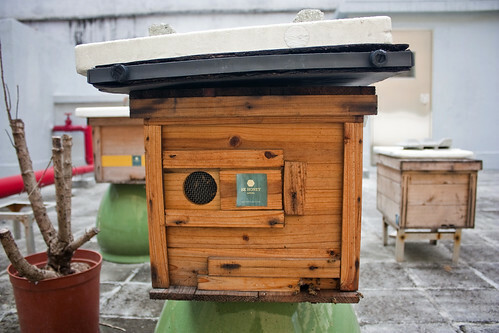 Bees buzzed in and out of nearby hives, part of another project, HK Honey, that has established urban hives around Hong Kong. “We’re growing a lot of flowering plants so there is a relationship between the bees and the produce,” said Leung. Two birds landed on the roof and began chirping. “You never used to see that around here,” he said. HK Farm often receives groups of schoolchildren who learn how complex ecosystems can exist even in the concrete jungle of an industrial zone. It’s also a lesson in another type of ecosystem. HK Farm’s soil comes from Ma Po Po, a community farm near Fanling, and it’s kept loose with rice husks from Hong Kong’s last de-husking plant. “And we fertilize the soil with local food scraps from the dai pai dong and canteens nearby,” along with sawdust from the furniture workshop downstairs, said Leung. “Maybe this will be the Noah’s Ark for creatives,” mused Ellingsen. A similar discussion has been taking place at Hidden Agenda, which has served as a cultural anchor for Kwun Tong since it opened in 2009. 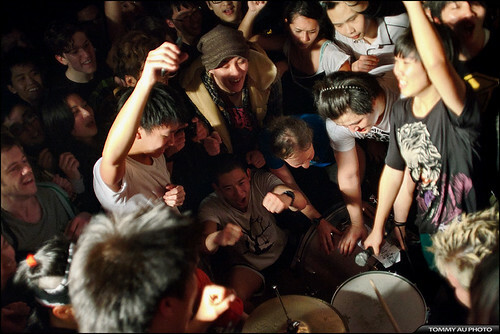 More than 80 percent of Hong Kong’s independent bands are based in the area’s industrial buildings; Hidden Agenda is the first place many of them performed before a live audience. It hosts around 15 shows every month and it doesn’t charge musicians to play. Local musician Kung Chi-shing credits the venue with improving the quality of Hong Kong’s indie music scene. “One live gig is worth more than 20 practice sessions,” he says. But Hidden Agenda is locked in a battle with the government, which refuses to grant it a licence to operate. Earlier this year, Energizing Kowloon East offered Hidden Agenda space to operate beneath a highway flyover next to the Kwun Tong waterfront, but the venue’s managers refused. This entry was written by Christopher DeWolf , posted on Wednesday September 19 2012at 07:09 am , filed under Architecture, Art and Design, Asia Pacific, Europe, Heritage and Preservation, Interior Space, Music, Politics, Public Space, Society and Culture and tagged Gentrification, Hong Kong, Informal Space, Kowloon, Kowloon East, Redevelopment, Rooftops, Urban Agriculture, Urban Development, Urban Renewal, Venice, Venice Biennale of Architecture . Bookmark the permalink . Post a comment below or leave a trackback: Trackback URL.